It's a brush off that my mother uses often. "Oh, one of your internet friends?" As in "They're not real friends, they're just people you type to." This is not true, and dismissing them as pixels on a screen can be hurtful. In the age of social media, "internet friends" can be the people you are closest with in the world, can be people you develop incredibly close relationships with, even romances, and chalking them up to "just internet people" can be harmful to the person in question. So let's celebrate our friends who live far away, sometimes on other continents, who we have friendships with despite the miles between us. Here's an example. I posed a question about purchasing a Christmas present for the tween in my life to my friends on Facebook, because I was completely lost as to what to buy. Almost immediately, I had friends from all over the country brainstorming about what to get her, and my problem was solved. This kind of thing happens all the time, sometimes with mundane questions, sometimes with life-altering situations. Friends you know through the computer are there just like a friend who lives down the street, and you learn quickly how much you can depend on them, and they on you. If that isn't a friendship - A REAL friendship, I don't know what is. Sometimes friendships online can even develop into romances, as friends on a platform like Facebook or Twitter grow into lovers, and the eventual meeting of the two have resulted in a surprising amount of marriages through the years. Are those marriages not valid because the two people in question were "just internet friends?" Of course not. The written word is extremely powerful, and the happy couples that have resulted due to social media are proof. See? The internet CAN be used for good! This is not to say that there aren't some pretty crappy people out there. The rise of the "catfish," which is the nickname of a person who pretends to be something they aren't online, is an unfortunate part of internet culture. 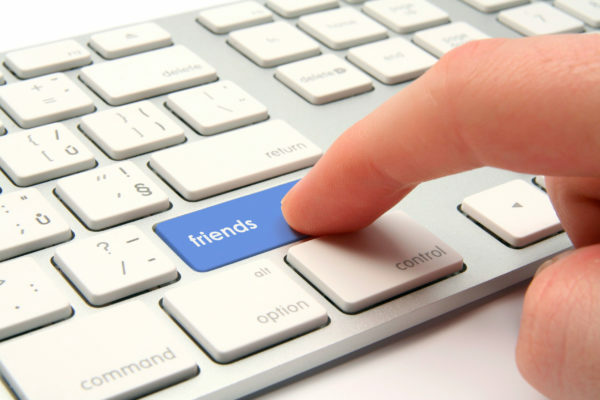 But this is a small fraction of people who develop friendships online. For the most part, whether you're on Facebook, Twitter, Instagram or Snapchat and meet people through groups or one on one, those friendships are just as valid as someone you meet "in real life." So don't believe people who brush off those friendships as "not real" when the people you are close to on social media hold a special place in your heart. They're as real as the feeling you have for them inside. What does your favorite celebrity chef say about you?